Over 22 years ago, Chrissie Rucker had a vision: to create a company that specialised in stylish, white homewares, combining the highest quality with affordable prices. What started as a range of white essentials for the linen cupboard - plump duvets, crisp sheets and fluffy towels - has gradually grown into the ultimate luxury lifestyle destination for your home, wardrobe, and little ones. From waking up in crisp white sheets to the feel of whisper-soft cashmere against your skin, we believe in using the very best you can afford, every single day, seeking pleasure in the simplest of moments. Gift E-Vouchers are valid for 24 months from date of last use whereby the remaining balance will be deducted, after such time the Gift Tender shall expire. Last use is when a Gift E-Voucher has been activated or redeemed. There are no limitations on how many times a Gift E-Voucher can be used (until the balance is £0.00). If you do not spend the entire balance on a Gift Card, the remaining balance will be updated after each transaction and shown on your printed till receipt. E-Voucher balance enquiries can be obtained in store, online or by calling 020 375 89 222. 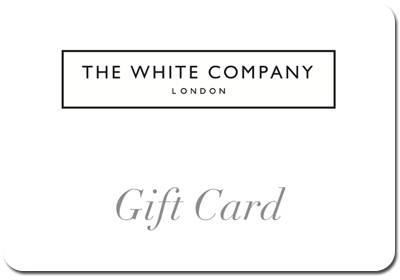 The risk in any Gift E-Voucher shall pass to you upon The White Company’s electronic transmission to you. The Gift E-Voucher remains the property of The White Company, and may not be tampered or interfered with, without The White Company’s consent. If E-Gift Voucher is found, please return to the nearest The White Company store.